International Business Lawyers NW Group is participating to "Forum Afrique Protected content which is a B2B event for professionals and investors in Africa, organised by famous MOCI (Moniteur du Commerce international) magazine and CIAN (Conseil français des Investisseurs en Afrique) with the support of the CCI Paris Ile-de-France. Programm : the exclusive resultats of the Protected content , 3 round tables, workshops and B2B. meetings. Who takes part to the Africa Forum ? Hosted by internationally renowned speakers, the Africa Forum brings together Protected content 700 executives, corporate executives present or wishing to invest in Africa. 9h Protected content Round table Protected content the obstacles, are new business models emerging? 11h Protected content Round table Protected content what innovative solutions to support transformations? What are the keys to success for companies in Africa? 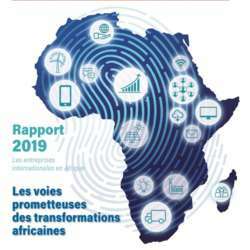 – 16h30 – 17h30: "Attijariwafa Bank Group's accompanying in Africa "
--> You can register access for free, but is it MANDATORY. you have to do it online previously as you need an "accreditation". I appreciate you having the intention to attend, please only register if you really can make it.